We asked and received the following valuable contribution from Mr Jaakko Aarnio. In his quite in-depth analysis, he explores a new model for research, innovation and translation to clinical practice. Precisely he examines here a multi-collaborative growth model through the use of Communities of Practice (CoP) and their underlying contexts, addressing service provisioning in health and care sector. Insights and recommendations can be take-away from all actors involved. The application of a multi-collaborative growth model for research, innovation and translation to clinical practice is examined through the use of Communities of Practice (CoP) and their underlying contexts addressing service provisioning in health and care sector. In particular, the preliminary findings presented here provide practical measures for the healthcare community, industry and academia in promoting user and service innovation and point towards new ways of working. It is recommended for all actors to participate in a framework that mediates between various stakeholder positions in different maturity levels in innovation chain and to use innovation procurement complemented by other financial instruments paving the way to early adoption and up-take. The given examples with evidences of successful impact are related to digital health, health and care services. The main aim of this paper is to describe the benefits of the integrated growth strategy approaches driven by purpose and paving the way from early developments to digital health solutions procurement. The role of the industry and in particular the SMEs as agile providers of disruptive solutions are essential for the early adopters. This article builds largely on growth strategies and use cases presented in a recent paper. The context of public procurement rules in order to purchase R&D services or innovative solutions (see e.g.,) is important because health service innovation is based on match making of the interests of several actors. In this article the CoPs are understood as a common domain of interest in which the actors enhance the practice, promote (institutional) expertise in service provisioning and facilitate the mediation between various stakeholder positions. Increased attention is given recently to understanding and modelling the various barriers and success factors to economic impact and clinical practice emerging from research excellence (see e.g.). Two most commonly used system models to understand the non-linear aspects of innovation are the two-valley innovation chain model (TVM) and quadruple helix model (QHM). In the TVM the first valley (of death) refers to the decreased capacity to translate the results of discoveries generated by basic research in the laboratory into practice as well as to successfully commercialise the discoveries. This has a negative impact on the research and knowledge base. The second valley refers to the limited capacity to synthesise, disseminate and integrate (translate) research results more broadly into practice and economic value. While the TVM suggests the necessity to bridge the innovation and translation gaps it does not provide the mechanism to mediate between the stakeholder positions. The QHM suggests that the non-linear interdependencies between the four key actors (academia, procurer in collaboration with the regional policy maker, industry and user) should be optimised to maximise the impact although it does not address the migration of thematic competences bridging the valleys of death (i.e., innovation and translation gaps between ecosystem types). The combination of these two models (TVM and QHM) paves the way towards a non-linear multi-collaborative growth model. It might be helpful for identification of the innovation pathways for specific challenges in service innovation. Like large societal challenges the model is process agnostic e.g., not respecting the organisational boundaries, the limitations of the stand-alone funding schemes or particular technology/science pillars. The linear models (such as those designed solely from the demand-side or those of the supply sides or research sub-themes) have been widely criticised as too simplistic to describe the complexity and diversity of the innovation process (see). This suggests that a critical success factor is a collaboration of committed stakeholders in a well-networked ecosystem based on a proven evidence in science. Therefore, to re-enforce positive impact any framework conditions based on the thematic collaboration and modern knowledge management practices must facilitate feedback loops and understanding of the risk mitigation measures for solutions and R&D service procurement. This is relevant to minimise the systemic failure and its cost. 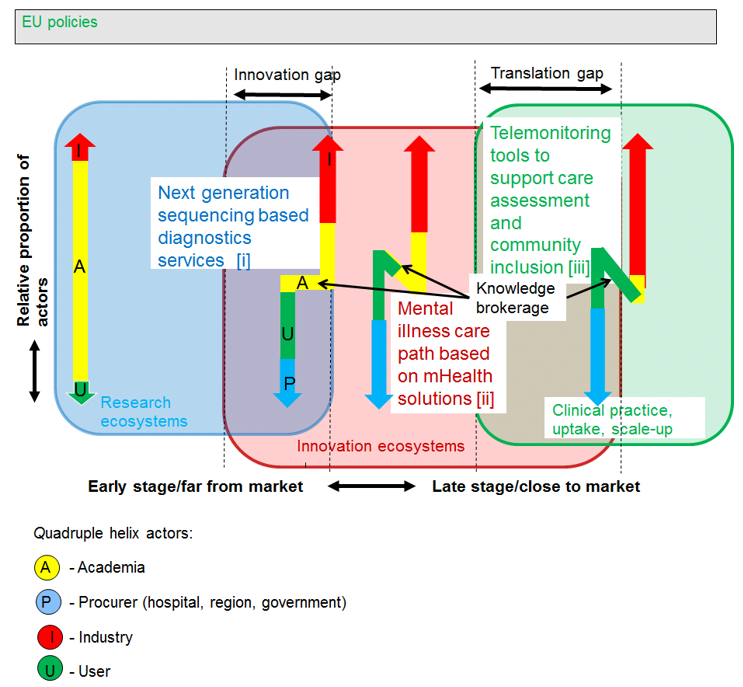 Figure 1 is a simplified view of three health and care service use cases in the innovation chain i.e., diagnosing, mental health and ageing mapped in the multi-collaborative growth model1. The Z-shape in vertical arrows of Figure 1 is a graphical representation of the market consultation and knowledge management situation (non-linear process) between the quadruple helix actors. The straight vertical arrow on the left represents a traditional collaborative research with all actors involved but targeting linearly a proof-of-concept. The colours and their proportions in the arrows are only for orientation purposes and demonstrate the evolution of the four stakeholder groups in the quadruple helix at different maturity levels. The proportion of academic actors that provide scientific value is typically high in the lower part of the maturity axis (straight arrow). The commitment and leadership of procurers, industries and users increases when the innovation value becomes evident and expected time to impact realistic. The three real life use cases of Figure 1 demonstrate that full ecosystem landscapes are necessary to speed-up the innovation and knowledge management cycles in right maturity levels. Use case [i] Next Generation Sequencing in diagnosing is on the verge of entering the innovation ecosystem in tertiary care. There is a strong scientific background and the time appears ripe for building the path to national deployment. Another use case [ii] in mental health is a service that uses a mobile app to improve the care path. Early adoption has taken place and first contracts between the health service providers and the supplier have been established. The third example [iii] is related to the large-scale deployment within the European Innovation Partnership on Active and Healthy Ageing. NHS in Scotland aims to provide a more preventative and proactive approach, supplemented with telemonitoring tools to support care assessment and community inclusion for older people and those living with long-term conditions. These examples suggest that multi strategy approach emerging from the positions of the actors and aligned governance practices are necessary for an efficient problem identification and management in different maturity stages of service innovation. Hence, from these hypotheses supported by the use cases, growth obviously happens when the unmet needs are met in market consultation and the competencies are thematically bridged in broad knowledge brokerage settings between the ecosystem types in agile CoPs and their underlying breeding environments. European Commission is supporting pro-actively such approaches in some Co-ordination and Support Actions (see e.g. ,,,). The creation of IPRs, standards and certification should be encouraged by design e.g., i) by developing pathways from scientific excellence to ethical and regulatory approvals early in the innovation process and ii) by addressing otherwise diverging expectations and conflicts of interests in well-defined code-of-conducts in the consultation processes. The governance and communication structures should support this line of logic. The presented empirical multi-collaborative growth model suggests that the potential for useful impact is improved when the unmet needs of health service providers and users are addressed in well-designed market consultation with industry fit to the relevant maturity levels. Consequently, it becomes increasingly evident that an integrated growth strategy (appropriate mix of four known strategies following the QHM) facilitates better identification of the challenges, prioritization, incentives and more realistic expectations of impact to the underlying eco-systems and society than a single-policy/strategy. Therefore, it is recommended that all actors participate in thematically constructed service innovation driven framework activities. This includes novel public procurement rules in order to purchase innovative solutions and R&D services, risk mitigation measures such as value engineering, addressing regulatory barriers very early in the innovation process, financial multi-instrument settings and new working methods. The given examples with evidences of successful impact in service provisioning in their respective maturity contexts support the presented hypothesis. Additionally, appropriate breeding environments for temporary CoPs would safeguard the renewal of themes and innovation pathways over time minimising the shortcomings of static linear plans and the cost of systemic failure. The European Commission is acknowledged for facilitating this work.